This classic detached garage features dormer windows into the upper storage space, offering a country look. Additional storage space under the staircase is an ideal location for garden tools and other lawn equipment. 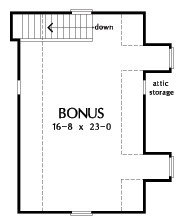 Bonus Room: 464 Sq. 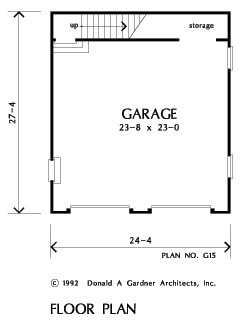 Ft.
House Dimensions: 24' 4" x 27' 4"
Bonus Room (Vaulted): 16' 8" x 23' 0" x 8' 9"